As you can see, the population part dominates the whole panel and it is in the middle while doing so, and for good reason. Their production determines what you get out of a region (although buildings affect this as well), and their loyalty determines if the region is in unrest. Their loyalty in turn is determined by their status and ethnicity. But more on that later! Food has three uses: feeding the existing population, population growth (when you have a surplus) and feeding armies in or adjacent to the region. Infrastructure is used to construct buildings, and to maintain existing ones. As such, the more buildings you have, the more population units you will need to keep them up and running. You can also gain extra Infrastructure points from several buildings, but beware: a region can only have as many buildings as it has population units, so you need to make choices. Buildings themselves are a long and interesting subject so we will cover them separately. Money might not buy you happiness, but it is useful for a great number of things. 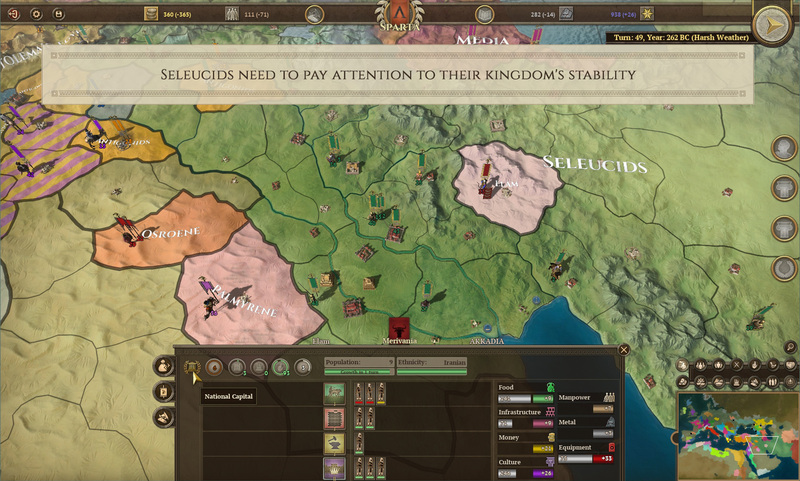 It is mainly used to recruit and maintain military units (especially mercenaries), but also a great deal of it may be needed to push through some of the Decisions available to your nation. Money, unlike the previous two, goes into your national stockpile, not the region’s. Culture is probably the most abstract of the four. It represents an aggregate of cultural life, works of art, luxuries etc. While it does add to your national total Culture, it has both national and regional uses. 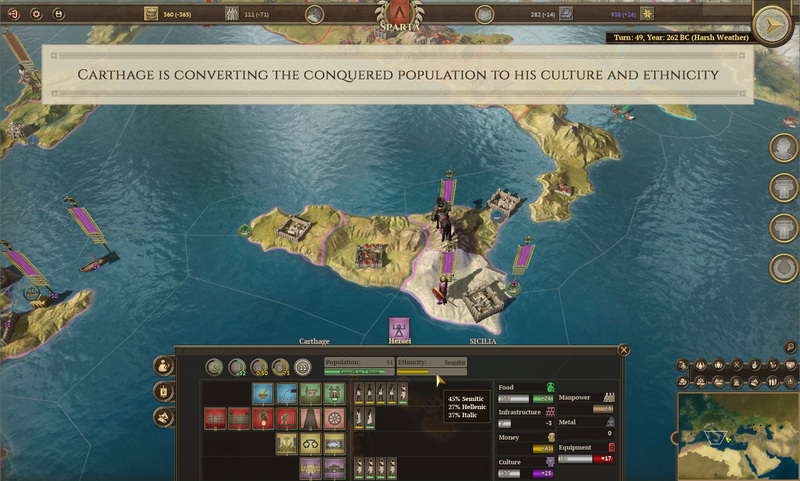 On the regional level, Culture reduces Unrest and helps keeping the local population content with your rule. There is a limit to that though, and for populous regions, you’ll need to boost loyalty with dedicated buildings. Nationally, your overall Culture production drives your progress in the Progress & Decadence mechanics defining your nation’s age and status. This is a key and fairly unique system that we will be covering in a separate diary. On the left of the population units, you can see the buildings in the region. These are organised into the same rows as the population are and they largely relate to the production row they are in, although not entirely. We have six building categories: the four outlined above plus Health and Military buildings. Manpower and Metals are national resources that are required for the recruitment and maintenance of units. How much, depends on the unit type. As you might expect, armoured units require a lot of metal, whereas almost naked tribal warriors will not use that much. Equipment is a regional resource and represents the region’s ability to equip and field new military units. It can be stockpiled (within limits) so you can gather up a reserve that will let you react to unforeseen challenges relatively quickly. To finish summarising the general overview of the region panel, we should also mention the top row of the panel, which contains some general information (such as terrain, defence value, Loyalty) and icons of any good or ill conditions that apply to the region. We have mentioned earlier how important a region’s population is, so let’s take a closer look at it. A population unit in FoG Empires has three attributes: its Status, Ethnicity, and Unrest. Status can be either Citizen or Slave. Citizens are your free population. They grow based on your Food production. Slaves are obtained via major battles, or events and Decisions. Citizens perform better when assigned to Money or Culture production. Slaves are very inefficient at those tasks, but they are more efficient than Citizens when it comes to Food or Infrastructure production. Ethnicity is the cultural identity of the population unit. Each nation has a primary Ethnicity, and if the pop unit’s is different to this it affects its Unrest negatively, especially if the nation in question is at war with the pop unit’s perceived brethren (i.e. a country with a primary Ethnicity matching the population’s). Population units can, in time, convert to their region’s majority Ethnicity (only true for citizens). Unrest shows how dissatisfied the population unit is with their lot in life. As mentioned, this is affected by Ethnicity but also by the region’s overall Loyalty rating, which is derived from a number of national and regional factors. In fact, let’s have a closer look at it! 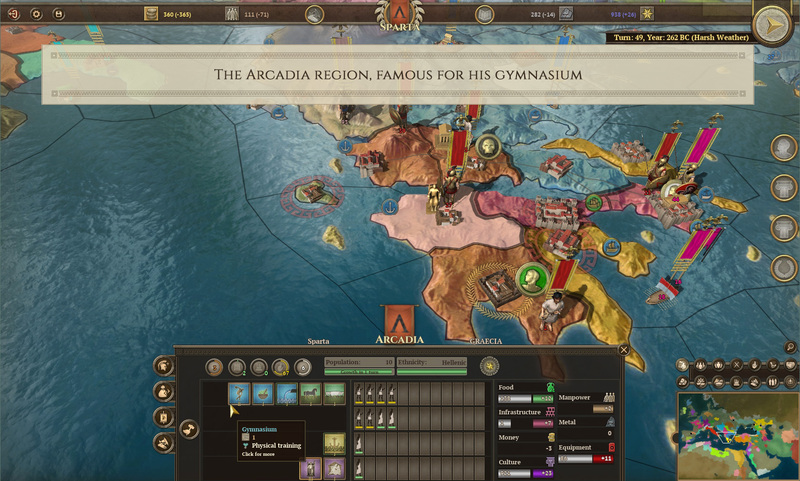 Regional Loyalty is one of the cornerstones of the game, because it meshes with others major features, like progress and decadence, army recruitment, supply, and productivity. Usually at start, loyalty is not a major issue (except for the Seleucids and a few other nations). That’s because your starting regions are of the same ethnicity as your nation’s government, plus the population is not so high that the bored citizens demand too much from the state. As you expand, and as time passes, you’ll probably conquer new regions, and they might be populated by citizens from another ethnicity group than yours. Say you are Rome and past Italy, you start conquering Gaul. Gaul is made of Celts, and Rome ethnicity is Italic. This alone will make the subdued population much more restless. With some effort and the passing of time, you might convert them (shall we say Romanize?) to your ethnicity, but it won’t happen quickly. Slaves too have an ethnicity, and they are never converted, so expect troubles from a massive influx of German slaves for example. In addition to that, each of your national citizens, when your main cities grow bigger, will demand more and more from the state, and this translates to an increase in their unrest, which in turn can lead to revolts. As you can guess though, you have several possibilities to fight off unrest. A major one is to build loyalty-boosting buildings. Some are rather virtuous in their use, like the line of religious buildings, which provide a moderate loyalty boost and an increased chance of converting the local population to your ethnicity. But for larger effects, it will be required to build structures like an arena, a gambling ring, a pleasure house, a noble district, and many more. And in the short term, they are doing exactly what you need, they will up the regional loyalty quite a lot. All is well, right? Not so. In the long run they distil their poison… They will produce a bit of decadence over time. Which in turn will perhaps make your nation regress and have larger issues, like a civil war! But we will talk more about Progress & Decadence in another diary, as this is a major feature of our game, with a quite original approach. Thanks for your time, we will continue explaining the game’s regional-level features next week!